FEATURE – The life of Susanna Mehitable Rogers Sangiovanni Pickett Keate is not a by-the-book pioneer story like so many others. An explanation of how she managed to “earn” her long name is an indication of the privations she suffered in her journey of faith. Her story began on July 5, 1813, when she was born on the shores of Lake Champlain between New York and Vermont. Her father, David Rogers, was a fur trapper and from the age of 5 she started accompanying him when he set his traps even though she later admitted that it pained her each time one was caught. Even her father said it was a distasteful occupation but there was good money in it. When the Marquis de Lafayette heard this, he spoke directly to Susanna, saying “My dear, you honor me”; and in a regal manner, as though he was saluting a queen, he doffed his hat, bowed and kissed her hand – something she would remember all her life. Since Sangiovanni had a price on his head, the family moved frequently, finally settling in Liverpool, England, for a time and then London. Susanna received lessons in French and Italian to be able to communicate with all the guests, many of them Italian and French refugees, and even her husband, whose English wasn’t the best. A son, Gugliemo, was born to them. Gugliemo became the object of Susanna’s affection and Sangiovanni’s jealousy. Life was unbearable for Susanna because her husband had a horrible temper, was regularly on unexplained trips and kept a locked room in the house that she was not permitted to enter. Susanna found comfort in prayer, asking her Father in heaven for guidance. She had a dream in which she turned a familiar corner and saw two young men preaching to a crowd. The men told her not to fear and that all would be well and that a key would be left to her that would provide the means for her to make the journey she was destined to make. In her biography of Susanna entitled “In Search of Living Water,” Jane Rae Fuller Topham, writes that on a Sunday afternoon, Aug. 30, 1840, Susanna, then living in London, took her son for a walk and heard strains of religious music. As she approached a park on Old Street, she recognized the place of her dream, Tabernacle Square, and it was there were she saw the exact likenesses of the preachers in her dream – Mormon elders Wilford Woodruff and Heber C. Kimball. She could tell the Spirit was with them and longed to talk to them; and when she did, Susanna expressed her desire to be baptized. She sneaked out frequently to hear the preaching again and when her husband found out, he was enraged and showed her false newspaper accounts of Mormons plundering innocent people. 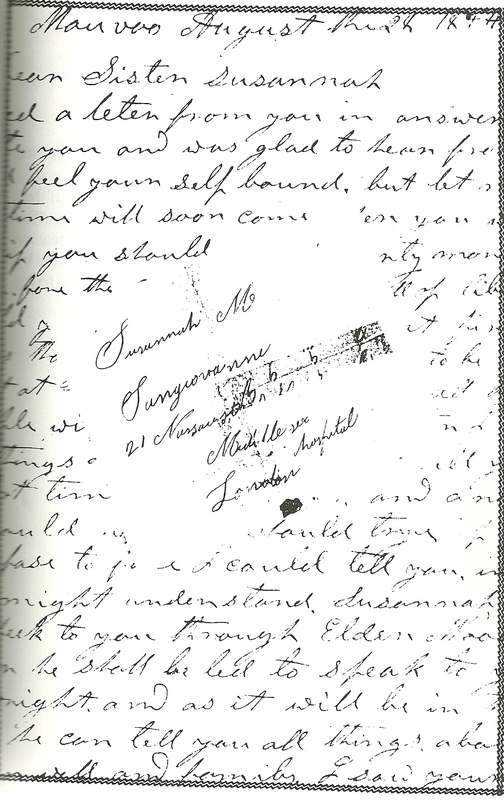 Susanna came to find out later that her parents had converted to Mormonism and received a letter delivered by Parley P. Pratt detailing their conversion story and encouraging her to unite with the faith. In an Oct. 8, 1840, letter to Susanna’s parents, Heber C. Kimball told the Rogerses of their daughter’s desire to be baptized. 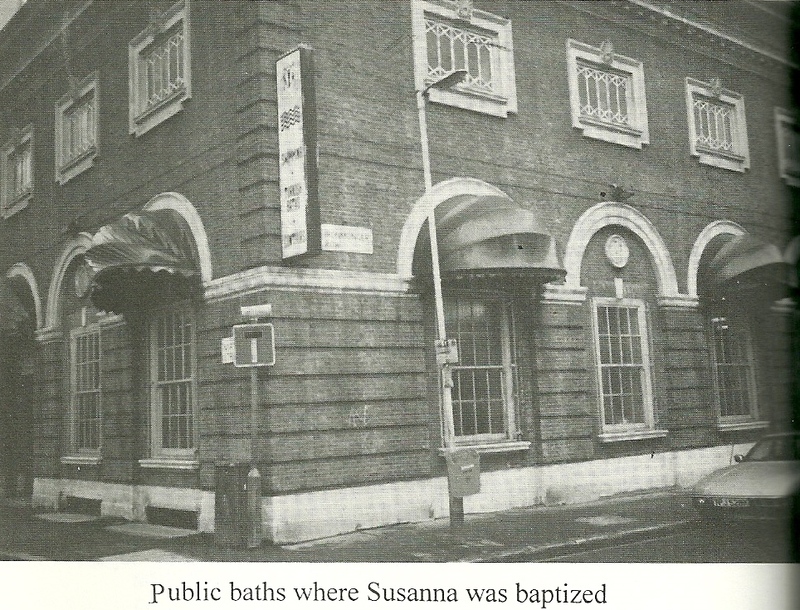 Woodruff and Kimball made visits to Susanna’s home to try to convince Mr. Sangiovanni to allow her to be baptized. Benedetto Sangiovanni enjoyed telling the missionaries of his exploits and by showing interest, they became welcome visitors; but they could not convince him to relent on his wife’s baptism. I am so low spirited and so beset on every side that I hardly know who, where or what I am. Everything seems against me more than ever, but I have been so long used to crosses and disappointments that they seem quite natural. Seeing her tenuous situation at home, Woodruff and Kimball finally relented and baptized her without her husband’s permission. She slipped quietly out of the house one Sunday morning, Feb. 8, 1841, under the pretext of taking a walk, met the missionaries and then walked to the public baths where she was baptized a member of The Church of Jesus Christ of Latter-day Saints by Heber C. Kimball. Even though her heart rejoiced, Susanna still had to endure life under the auspices of her jealous husband a little while longer until she later found out that his first wife was still alive, making herself, in fact, an illegitimate wife. The family moved back to Liverpool and it was at this time that the second part of her dream was fulfilled. Benedetto Sangiovanni left on one of his many trips, but returned quickly because he had forgotten something, leaving his keys on the table while rummaging through some papers that he quickly found and hastily returned to his carriage … without his keys. When he left, Susanna took the keys and opened the door to the room from which she was forbidden; there she found a chest of dark wood that turned out to to be a veritable treasure chest for her – money bags and a heap of gold coins – that she took and put in her apron. Having just hid the coins in the door and put back the keys, Benedetto Sangiovanni returned looking for them and found them right where he left them. That was the last time she saw her husband as she realized this was her ticket to freedom. She packed up a few belongings and with the help of a network of LDS members, used the gold she had found to pay her and her son’s passage to New Orleans and then their steamship passage to St. Louis in 1846. Beginning in St. Louis, Susanna’s story closely aligns with other pioneer stories. She met and married William Pickett in St. Louis, becoming a plural wife whom Pickett kept secret from his first wife. This marriage didn’t last and was annulled but from it came a son, Horatio, born in Winter Quarters on May 10, 1848. In 1849, she returned to New York and was reunited with her parents, allowing her sons to finally meet their grandparents, aunts and uncles. Susanna started traveling toward the Salt Lake Valley with her siblings and parents in the spring of 1851, but because of flooding, the rivers were too high to cross so they waited another year, finally arriving in the valley in 1852. 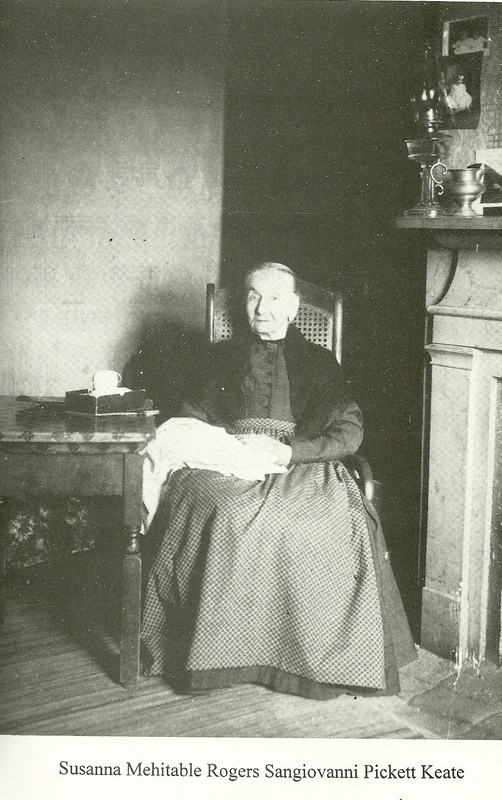 She stayed in the home of her sister’s family and later that year began teaching school in the home, keeping the children’s interest with stories of her travels. In 1856, Susanna met and married James Keate, a widowed shoemaker. It was a marriage of convenience, according to some accounts. In January 1861, James Keate, then 57, married a second wife, 15-year-old Verbena Christofferson. 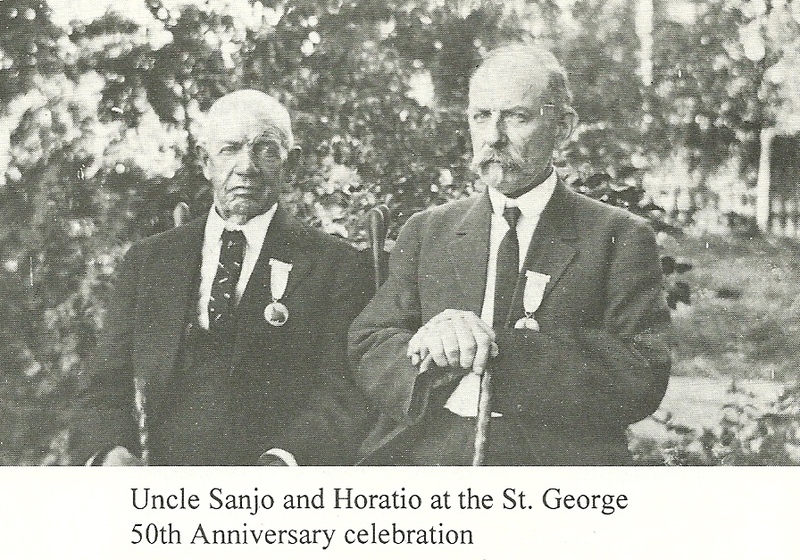 Also in 1861, James Keate was among the first to be called to settle what became southwestern Utah. The Keates sold their homes, bought two wagons and loaded them with the barest of necessities and arrived south in December 1861. A barren wasteland compared to what she was used to, Susanna made the best of her new surroundings and started teaching school in a wagon box with very few textbooks and supplies available. A little later, Susanna and James Keate took in a little Indian girl who was stolen from her tribe by a group of Indians who threatened to kill her if no one bought her. The Keates obliged. Her name was Cora and Susanna treated her as her own and raised her to maturity, when Cora fostered three Indian children of her own. Under her husband’s tutelage, Susanna learned how to make shoes and later made shoes for her grandchildren, who affectionately referred to her as Grandma Keate. Susanna died at the home of her son Horatio on Jan. 9, 1905, having lived 92 colorful years. “Mrs. Keate was a consistent and faithful Latter-day Saint and was loved and respected by all who knew her,” her obituary read. Author’s note: Besides Topham’s book, information for this story was gleaned from several accounts with no listed author that were sent to the author of this article by Jeanine Vander Bruggen and Teresa Orton of the Daughters of Utah McQuarrie Memorial Museum in St. George. St. George News “Days” series, featuring stories aimed at helping people enjoy the Southwest Utah region’s history as much as its scenery. Daughters of the Utah Pioneers McQuarrie Memorial Museum | 145 N. 100 East, St. George | Telephone 435-628-7274 | Free admission | Hours 10 a.m. to 5 p.m. Monday, Tuesday, Thursday, Friday and Saturday | Facebook page. Washington County Historical Society webpage about the Daughters of Utah Pioneers McQuarrie Memorial Museum in St. George. International Daughters of the Utah Pioneers website. Keepapitchinin blog post providing more details about Keate’s life. 'Always keep good company.' Advice that inspired a pioneer legacy.